African Americans see a widening gulf between the values of middle class and poor blacks, and nearly four-in-ten say that because of the diversity within their community, blacks can no longer be thought of as a single race. The new nationwide Pew Research Center survey also finds blacks less upbeat about the state of black progress now than at any time since 1983. 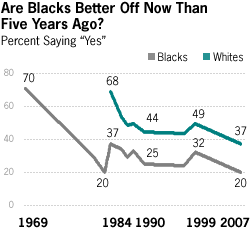 Looking backward, just one-in-five blacks say things are better for blacks now than they were five years ago. Looking ahead, fewer than half of all blacks (44%) say they think life for blacks will get better in the future, down from the 57% who said so in a 1986 survey. Whites have a different perspective. While they, too, have grown less sanguine about black progress, they are nearly twice as likely as blacks to see black gains in the past five years. Also, a majority of whites (56%) say life for blacks in this country will get better in the future. Telephone interviews for this survey were conducted among a nationally representative sample of 3,086 adults from September 5-October 6, 2007. African Americans and Hispanics were over-sampled – a total of 1007 interviews were completed with blacks, and 388 with Hispanics. 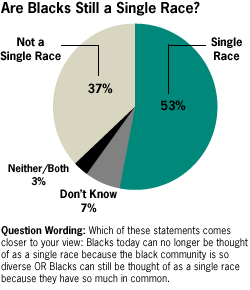 Asked whether blacks can still be thought of as a single race, given the increasing diversity within the black community, 53% of blacks say they can, but 37% of blacks say they cannot. Big gaps in perception between blacks and whites emerge on many topics. For example, blacks believe that anti-black discrimination is still pervasive in everyday life; whites disagree. And blacks have far less confidence than whites in the basic fairness of the criminal justice system. But there are also areas of agreement. For example, blacks and whites concur that there has been a convergence in the values held by blacks and whites. On the popular culture front, large majorities of both blacks and whites say that rap and hip hop have a bad influence on society. Blacks and whites express very little overt racial animosity. As they have for decades, about eight-in-ten members of each racial group express a favorable view about members of the other group. More than eight-in-ten adults in each group also say they know a person of a different race whom they consider a friend. The most newsworthy African American figure in politics today – Democratic presidential hopeful Barack Obama – draws broadly (though not intensely felt) favorable ratings from both blacks and whites. But blacks are more inclined to say that his race will detract from his chances to be elected president; whites are more inclined to say his relative inexperience will hurt his chances. Three-quarters of blacks (76%) say that Obama is a good influence on the black community. Even greater numbers say this about Oprah Winfrey (87%) and Bill Cosby (85%), who are the most highly regarded by blacks from among 14 black newsmakers tested in this survey. By contrast, just 17% of blacks say that rap artist 50 Cent is a good influence. Over the past two decades, blacks have lost some confidence in the effectiveness of leaders within their community, including national black political figures, the clergy, and the NAACP. A sizable majority of blacks still see all of these groups as either very or somewhat effective, but the number saying “very” effective has declined since 1986. A 53% majority of African Americans say that blacks who don’t get ahead are mainly responsible for their situation, while just three-in-ten say discrimination is mainly to blame. As recently as the mid-1990s, black opinion on this question tilted in the opposite direction, with a majority of African Americans saying then that discrimination is the main reason for a lack of black progress. On the issue of immigration, blacks and whites agree that most immigrants work harder than most blacks and most whites at low-wage jobs. Also, blacks are less inclined now than they were two decades ago to say that blacks would have more jobs if there were fewer immigrants.